Insync is currently available on private beta. 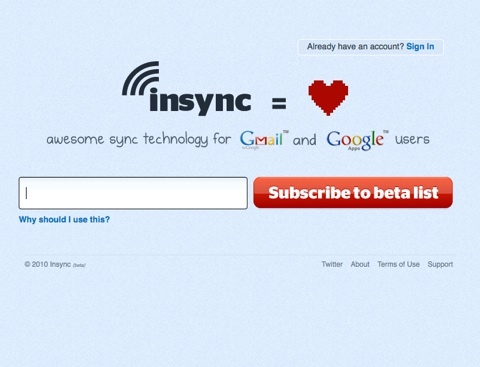 Not to be confused with the boy band N Sync, Manila, Philippines-based web technology startup Insync is a synchronization platform for Gmail and Google Apps users. Founded by Terence Pua and Marte Soliza, Insync keep files in sync between computers, friends, coworkers and clients. It is cross-platform, tightly integrated into the operating system (OS), and runs in the background. Co-founder and CEO Terence, who obtained an electrical engineering degree in the United States, spent a number of years in Silicon Valley before deciding to go to Manila for a breather where he ended up ‘getting stuck’ for over six years. His first experience with a startup was starting his own, from his parents’ house where he started coding out of his old childhood bedroom. That was after a short working stint at a Fortune 500 company, where he lasted exactly one year. Terence was responsible for opening Friendster‘s office in the Philippines, which he ran for almost two years. That was where he met future co-founder Marte, whom he brought into Friendster as a squeaky new 17-year old programmer as a computer science student at the University of the Philippines. They stayed in touch when Terence left the social networking site, and when he decided to start another company, Terence promptly called Marte. Terence has always been interested in the online storage business and has been looking at it for the past five to six years. He first started on the idea with an iTunes synchronization application that allowed different iTunes libraries from different computers to be synced over the air and backed up. “I had three laptops and they all contained different libraries, and it was a pain keeping them in sync,” Terence recalls. He soon evolved the idea to include all files in general, beyond just music. Insync was born. Insync is really the second name of their product. Its first name was isyncd but they were afraid of a backlash from technology giant Apple – which recently became overtook Microsoft as the world’s largest technology company in terms of market capitalization – and modified the name to keep their logo. Its target customers are Gmail and Google Apps users who need to keep files between computers, co-workers and third parties in sync as well as give them offline access to Google Docs. “If you have ever emailed files to yourself or named files as word_draft_ver12.doc, then Insync automates and solves those problems,” explains Terence. “For example, if you have 35 employees and you use Google Docs, you can integrate Insync to all your employees via user provisioning and each employee has Google Docs offline access as well as built-in versioning. They can also use their Gmail login. Super easy.” Its business model revolves around a per user per month basis, as well as charging for extra storage. “We were bootstrapped for a long time using my own money until this year when we raised our seed round.” 18 months in the making, Insync recently raised funding from seed-stage investors phiLabs in the six-figure (USD) region. Insync co-founder Marte Soliza (left) takes a break during an intermission at Echelon 2010, while fellow co-founder Terence Pua lets detractors of Insync and Echelon 2010 know what he thinks of them. Insync was one of the participating startups that exhibited at the recent Echelon 2010 web technology event in Singapore. Michael Smith of Yahoo!, better known as Smitty, had introduced him to the e27 folks, the organizers of Echelon 2010, and got him interested in the event. Terence says he met many ‘smart and interesting folks’ there, and got plenty of feedback for Insync. Other participating startups had many good things to say about Insync. Serkan Toto of U.S.-based technology blog TechCrunch, who was at Echelon 2010, even called the Philippines-based startup as one of those who stood out from the crowd. “I think something like 20 percent of the attendees signed up for our beta,” Terence says, who adds that he’s been really impressed by the startup founders he met there.